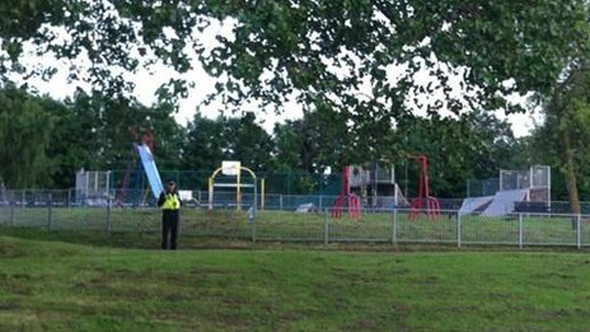 A nine-year-old boy has been stabbed by a man in a skate park in West Yorkshire. The boy was attacked at about 16:40 BST at the Carnegie Skate Park, in Shipley, West Yorkshire Police said. He was taken to Leeds General Infirmary by air ambulance where his condition is said to be stable. Police are hunting for a white man, in his twenties wearing a cap and glasses and carrying a walking stick in relation to the attack. A police spokesperson said: "This is being treated as a critical incident and numerous resources have been deployed to the scene." Witnesses have been asked to contact police or Crimestoppers. Hawarun Hussain, Green Party councillor for Shipley, said: "It is shocking. At no point do you ever think that your child is going to go to the skate park and get stabbed. It's just not expected. "The skate park is relatively new. It was the kids who wanted it. "It was meeting the demands of the children wanting a skate park where they could go and be safe and enjoy themselves."